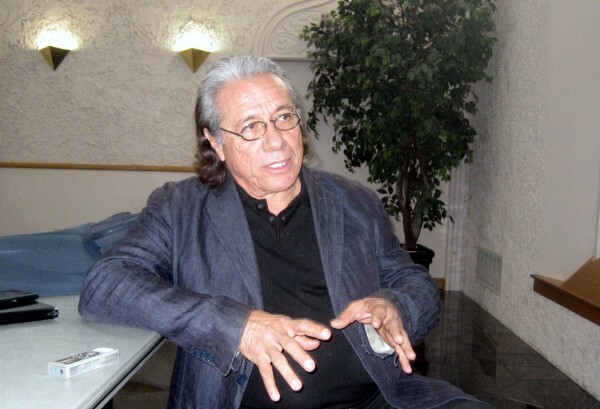 On November 9, 2011, Salt Lake Community College staff, students, faculty and the general public had the privilege of listening to actor and activist Edward James Olmos give two lectures at the Grand Theatre on South City Campus in conjunction with the Tanner Forum on Social Ethics. He started by speaking in Spanish, thanking the audience for coming out and expressing how much he loved seeing everyone there together. He asked everyone that understood him to raise their hands. About half the room held their hands up. He then announced that everyone who was “Spanish-impaired” need not worry because he would be speaking in English. From then on, it was not just a lecture, but a conversation that everyone in the room was involved in. “God bless the Occupy Wall Street people,” said Olmos. He compared the Occupy movement to the Vietnam demonstrations. He recalled how when the Vietnam demonstrations started, there were only a handful of people involved and then it turned to fifty. Fifty became hundreds, then it quickly rose to hundreds more, and it then climbed up to thousands and thousands. He said the same thing is happening with Occupy. The people are getting tired and want to be heard. “Those of us who watched the Vietnam demonstrations look back and wish we would’ve been a part of it,” Olmos said. He encouraged everyone in the audience to help the Occupy movement in any way possible. If you could not be there with everyone camping out, take food out to them, or just show support in whatever way you can. He reminded everyone that if you were to be a part of it, you could not get violent. Olmos then talked about the importance of getting as much education as possible. “You must get your masters, you must get your doctorates,” Olmos said specifically to the students that were in attendance. He encouraged everyone in the room to not just settle for a bachelors degree. One might automatically think about the debt that would pile up going to this much school, but Olmos assured everyone that it would be worth it. He said that if you get your masters, you will be able to pay back any loans. Olmos then talked about the value we should place on the people in our families who have come before us and our indigenous roots. “We Latinos don’t like half of ourselves. Get over it,” Olmos said. “I wouldn’t be who I am without them. That’s who I am,” Olmos said about his own European, Chinese, and African roots. He called everyone’s attention to their own background and told them to search more on their own so that they can learn to appreciate not only their ancestors more, but also themselves. Another example he gave to explain why many Latinos do not like their European heritage is because of school. He said that the school system should not be feeding the children of America a “one course diet,” meaning that it is important for kids to be able to dive into learning about other cultures. “In Arizona, they made it illegal to teach Latin studies,” Olmos said. He warned everyone that those kinds of laws would make their way to Utah before we knew it. He said that we have to teach the youth of today about all national heroes, even though they are not in all the schools’ history books. The youth need that kind of knowledge for the future. He then talked about how we as humans should not think of differences in race, but rather we should have the mindset that we are all of one race. “If you think there is an Asian race, a Latino race, a white race or a black race, then you’re part of the problem,” he said. He reminded everyone that there is just the human race. Olmos left the audience with the piece of advice to start becoming “wise-selfish.” It meant to not just get up each morning, go to work, come home, be with your family, then go to sleep. He explained that in order to be “wise-selfish,” you would have to get up each morning, go to work, come home, be with your family, and before you went to sleep, go to your front door and make sure your neighbor was doing okay. “The future of us depends on how selfish we are,” he said.